A large part of carp fishing revolves around the baits we use, such as particles (which mainly consist of seeds and nuts), and more nutritional baits in the form of boilies. Boilies have been around for a while in South Africa, but it is slowly growing in popularity as anglers realise its benefits. New anglers can find fishing with boilies daunting and confusing – it is so easy to get lost between all those colours, flavours, smells and shapes available. With so many options to choose from, and the opportunity to make them yourself, where does one really start? Well, let’s have a look at the types of boilies available as well as the advantages and disadvantages of each, and perhaps you can decide for yourself. If you are prepared to opt for a smelly, messy kitchen… pop in regularly for a series of in-depth articles surrounding the boilie making process. Boilies have been around the carp fishing industry since the 70s. It was developed by carp anglers in England that were using boiled pastes and seeds for their fishing. The boiled bait (hence the word boilie) formed a tough outer skin that would stay on the hook for longer, unlike bread or alternative baits that might crumble off the hook. This more durable form of bait gave carp more time to find it and kept the nuisance species and smaller fish away. Shelf-life boilies: There are various types of readymades available in shops for carp anglers to choose from. These boilies are called 'shelf-life' boilies as it's stored on a shop's shelf over a long period. These boilies contain a preservative component that keeps it fresh. Freezer baits: These baits are not that readily available in our country, but can be found in a store's freezer section. These boilies don’t contain preservatives and are frozen immediately after preparation, ensuring a fresh bait when thawed. Homemade boilies: These are no different in shape and structure when compared to store-bought boilies; the difference starts with the ingredients over which you have full control. It’s also stored frozen to keep it fresh – as you aren't using any preservatives. The bait has been developed and tested by other anglers before being released to the market. It has a long shelf-life that makes it ideal for storing, and you have easy access to a wide variety of products. 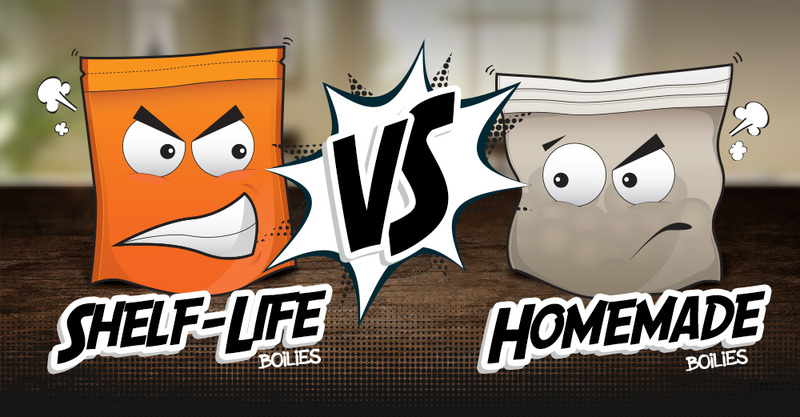 Shelf-life boilies are a great choice for time conscious anglers, as it saves you hours of messing up the kitchen and ruining that expensive pot you received from your mother-in-law as a wedding gift. If the bait is successful at a venue and a lot of anglers use it, carp will become wary of the bait to the point where they will avoid it. The preservative compounds in shelf-life boilies can also deter carp as they can detect and reject bait with their very fine sensors, and it can affect your catch rate. A good, well-known boilie that delivers consistently could come with a hefty price-tag. The cost of machines used for manufacturing, packaging, and advertising all contribute to the final price. It is a bait that is always fresh, and the angler knows the ingredients of the boilie, having full control over the process. It becomes a unique bait source as it's completely different from the angler next door (unless you copy someone else’s recipe). This gives you an edge and can improve your catch rate if you get the recipe down. Anglers can develop a nutritional bait that can benefit the carp, in a way giving back to our underwater adversaries. The price of bait is a major advantage (if you get it right and are successful), especially when heavy baiting of an area is needed. Many ingredients are available from supermarkets, health, veterinary and agricultural shops, making the costs of the bait less expensive. This is especially helpful when two or three anglers team up in a boilie making campaign, thus spreading the costs amongst themselves. Apart from the cost-effectiveness; the satisfaction you'll get from catching carp on your homemade baits is priceless. The bait has to be tested by the angler, and that can be frustrating, especially if you’re not getting results when you know other baits are working. Experimenting with homemade baits can become pricey when you don’t get the recipe right. Anglers making boilies in bulk might have to invest in a deep-freezer as to acquire more space. The tools you need to make boilies can be quite expensive, and sourcing specialised ingredients such as high-quality fishmeal can become a problem to find. Last but not the least, the kitchen war! Making boilies is a messy process, and your better half might not appreciate the smelly concoctions. Not to mention the piles of dirty bowls, buckets and splotches of strange flours all over the kitchen. A dedicated space is ideal if available – this is a hobby that can be a very time-consuming, and very messy. In the end, it all comes down to personal preference, and what you feel works for you. All options available have its advantages and disadvantages, so having that edge over the rest might depend on your enthusiasm and how far you're willing to take your angling. Some anglers thoroughly enjoy the experimentation that goes along with making homemade boilies; others might hate it. That is why we believe there will always be a place in the world for both options to flourish. Next up: Look out for the second part to this series – we will discuss the key components of a boilie and provide enthusiasts with a very basic recipe to get them rolling.